The exquisite island of Samos lies in the Eastern Aegean, very close to the coast of Asia Minor, in the heart of Ionia, almost midway along the sea route that links Greece with Anatolia, the Black Sea, Egypt and the Eastern Mediterranean. 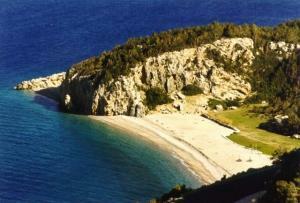 The name Samos is most probably of Phoenician origin and, according to Strabo, it means an elevated place on the shore. Over time, however, it had many other names: Anthemis, Dryousa, Doryssa, Kyparissia, Imvrasia, Melamphylos, and Parthenia. Beautiful and green, this island is filled with wonderful beaches, picturesque villages, and lovely harbors. The landscapes of the island, its climate, and the archaeological interests to be found here have turned Samos into a very popular resort, which gathers many tourists from around the world. Today Samos boasts a rich network of facilities and services for foreign visitors. Samos Hotel is located in the picturesque town of Samos, just across the road from the water's edge. It is one of the most well-known hotels on the island, and does have excellent facilities and recently renovated guest rooms and suites.